Do you live in a watershed? Your answer should be yes. Everyone lives in a watershed. A watershed is all the land that drains to a particular waterbody. Within each watershed, all water runs to the lowest point (a stream, river, or lake). Water travels over the surface or seeps into the soil and travels as groundwater. A watershed is also called a drainage basin or a catchment area. Watersheds are systems that include land, soils, plants, wetlands, animals, and people. All of these affect the water flowing through the watershed to the streams and rivers. What we do within the watershed affects waters for many miles downstream. If the land is not properly managed, there could be harmful effects to the waters including erosion, flooding, and degraded water quality. There are three watersheds in Trumbull County. 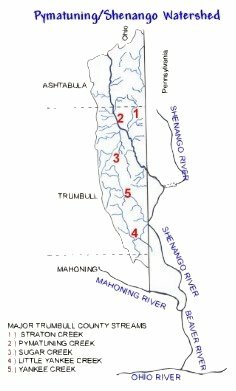 These include the Grand River Watershed, the Mahoning River Watershed, and the Pymatuning/Shenango Watershed. The Pymatuning/Shenango Watershed is approximately 1, 065 square miles or roughly 682, 310 acres. The watershed includes portions of Ashtabula, Trumbull, and Mahoning counties in Ohio and Crawford, Mercer, and Lawrence counties in Pennsylvania. Major waterbodies include Pymatuning Creek, Pymatuning Lake, Shenango Reservoir, and the Shenango River. Pymatuning Lake is the largest impounded waterbody in Pennsylvania and the Shenango River provides drinking water for four cities and five boroughs. The Pymatuning system flows approximately 70 miles. It begins as Pymatuning Creek in Ashtabula County, Ohio and Shenango River in Crawford County, Pennsylvania. These join at the Shenango River and flow south to to join with the Mahoning River to form the Beaver River, which joins with the Ohio River. Almost half (46%) of the watershed is in agriculture. A small percent is developed (5%) but concentrated in areas such as Hubbard, Ohio, Sharon, Pennsylvania, and New Castle, Pennsylvania. Forty-nine percent is comprised of woods and wetlands. The Shenango wildlife area, Pymatuning Lake, and Shenango Reservoir are considered some of the more ecologically sensitive areas along river corridors and are protected as game/wildlife refuges or as recreation areas. What is harming the Pymatuning/Shenango? Some pollutants of concern include nutrients, metals, chlorine, PCBs, pathogens, and sediment. Channelizing and altering stream beds, clearing vegetation, failing septic systems, development or agriculture without best management practices (BMPs) are all ways in which water quality can be degraded. Get involved! Get to know your watershed. Taking care of our resources can be as simple as cleaning up your trash. There are many ways to help. Contact your local Conservation District or watershed group to learn more. For more information on the Grand and Mahoning River Watersheds, click here.